Have you ever wished you were relaxing on the beach instead of shivering through the cold in the Christmas holiday season? If you know anyone like-minded, this could be the perfect ecards for them. 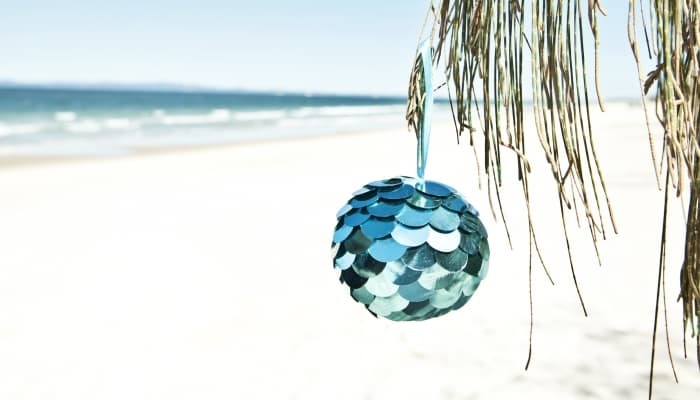 The card shows a sequined blue Christmas bauble dangling off the branch of a tropical tree and in the background is a beautiful sandy beach and crashing blue sea waves. A relaxing bask on this beach would give Santa a run for his money any day so send someone what they really wish for with this personalised ecards. If you’re really brave, you could even send this as a ‘wish you were here’ card if you’re lucky enough to be jetting away for Christmas. You can add humorous messages to the ecards that your recipients will love and you’ll never return to mailing a written card. If you have clients and colleagues you’d like to send a Christmas card to, these Christmas ecards for business are the best idea. It inspires comradeship between colleagues and it’s always a pleasant surprise for clients. There are many more corporate holiday ecards to choose from any many more occasions.